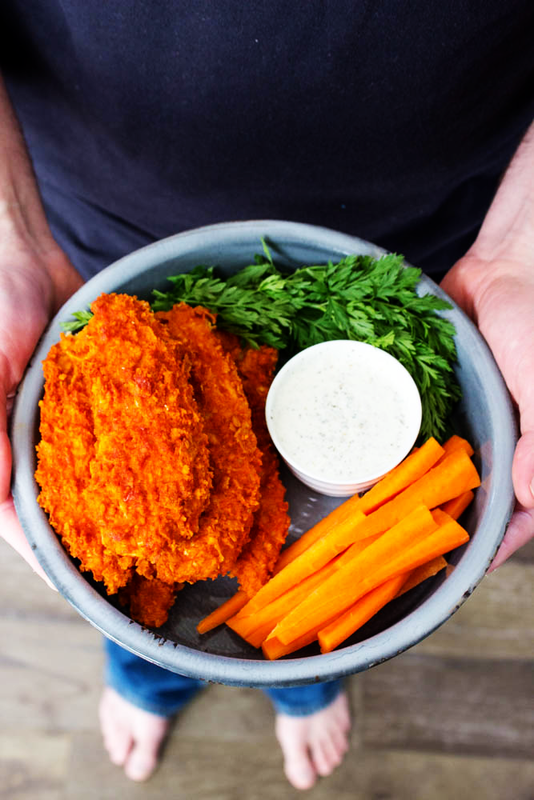 Delicious, crispy and packed with flavor these Baked Buffalo Chicken Tenders are quick and easy, making a great dinner or game time snack. 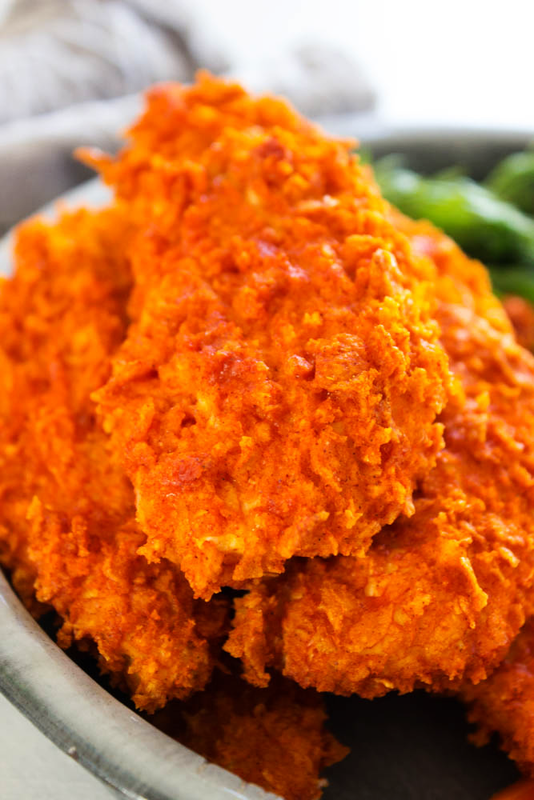 Move over chicken wings, these Baked Buffalo Chicken Tenders are even better. 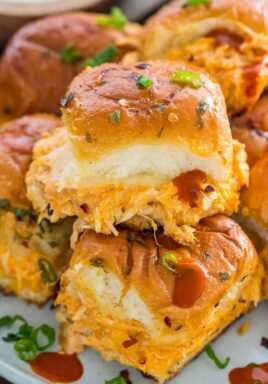 Baked to perfection and coated in traditional buffalo sauce they are full of heat and have a crispy outer shell made of Corn Flakes cereal and bread crumbs. Not only are these chicken tenders healthier but tastier too. 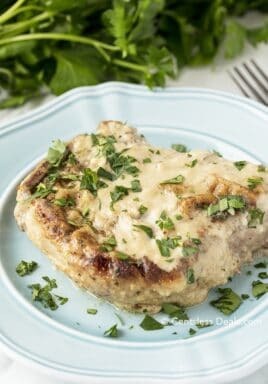 Pin it to your DINNER RECIPES to SAVE it for later! 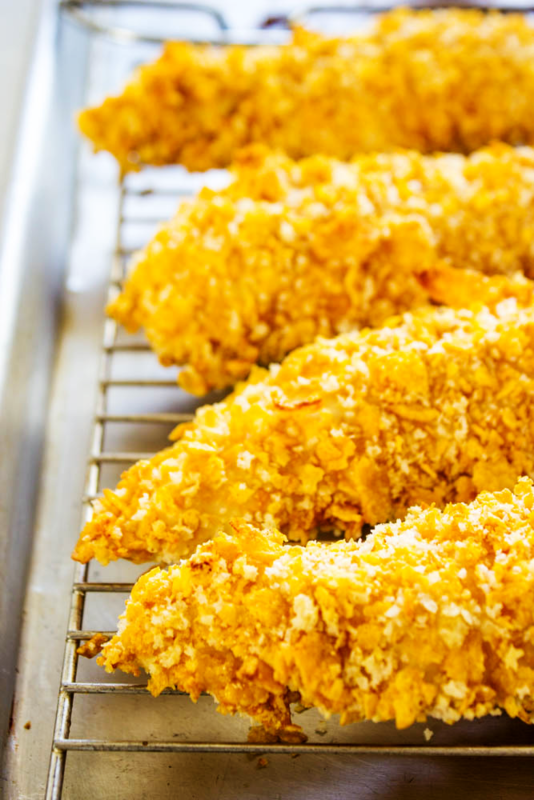 My family loves making baked chicken tenders for dinner or as a game day snack. We have made a few versions with a variety of dipping sauces, including honey garlic, ranch and salsa. Honestly, these baked chicken tenders are great served plain, without any sauce at all! The only other game day treat that beats the chicken tenders are chicken wings. Now let me be frank, I hate chicken wings with a passion. Not because I don’t like them but because of the mess my kids make eating them. Like full on mess on their faces, table and anything and everything they touch. When I asked the kids why they liked my chicken wings better than the chicken tenders it all came down to the sauce, buffalo sauce that is. 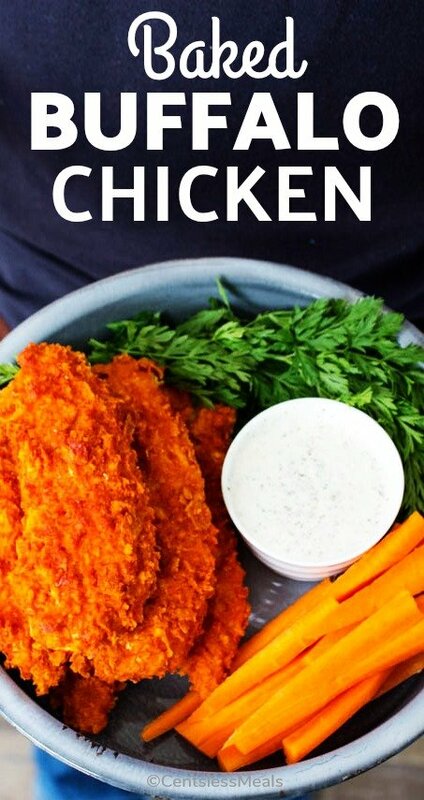 As soon as I found this out I immediately made these Baked Buffalo Chicken Tenders. Not only did I avoid any and all mess on their faces and fingers, these baked chicken tenders are healthier. What I love about these Baked Buffalo Chicken Tenders the most is how much they impress company that we have over. They are always oohing and aahing over these chicken tenders. I think that the crispy outer coating made of Corn Flakes cereal and panko bread crumbs is a surprise. The key to still making these crunchy even after being dunked in sauce, is cooking them a second time on broil. 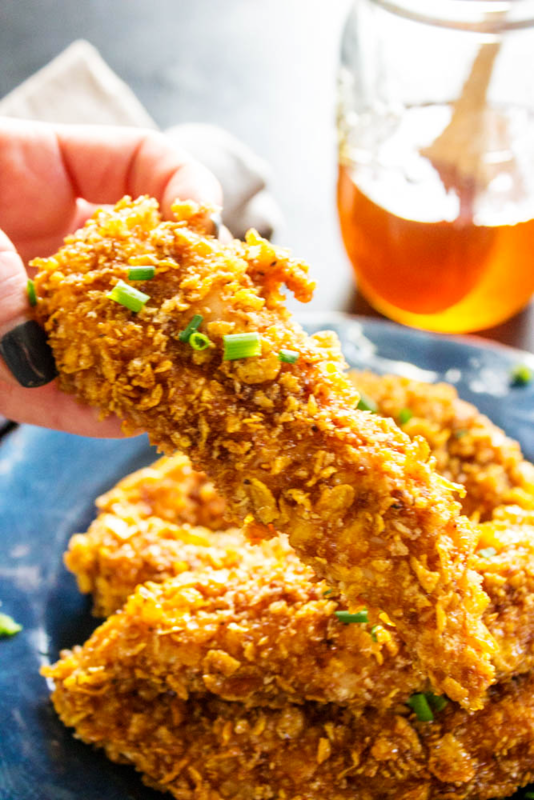 You could easily serve these chicken tenders on the sticky side, but who wants messy fingers running around their house? Not me. My hubs love these Baked Buffalo Chicken Tenders because of the heat. 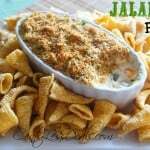 They make a beautiful game day appetizer too! 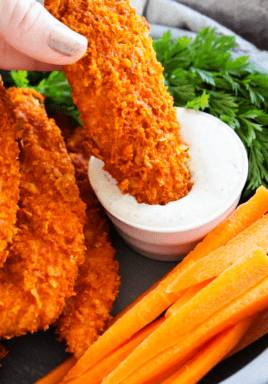 Serve with ranch or blue cheese dressing and of course some carrot or celery sticks and not only are these mouthwatering delicious, these Baked Buffalo Chicken Tenders are easy to make. So the next time you want to order or bake up some buffalo wings, try these Baked Buffalo Chicken Tenders instead. 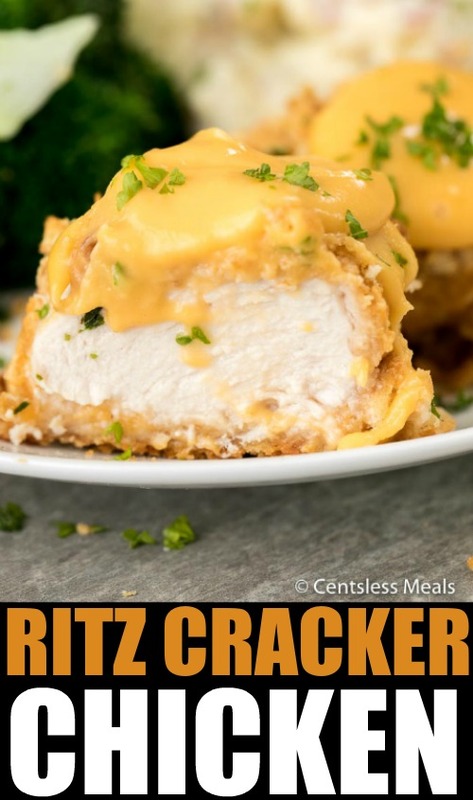 Not only will they be a real crowd pleaser but are guaranteed to make your monthly dinner menu. 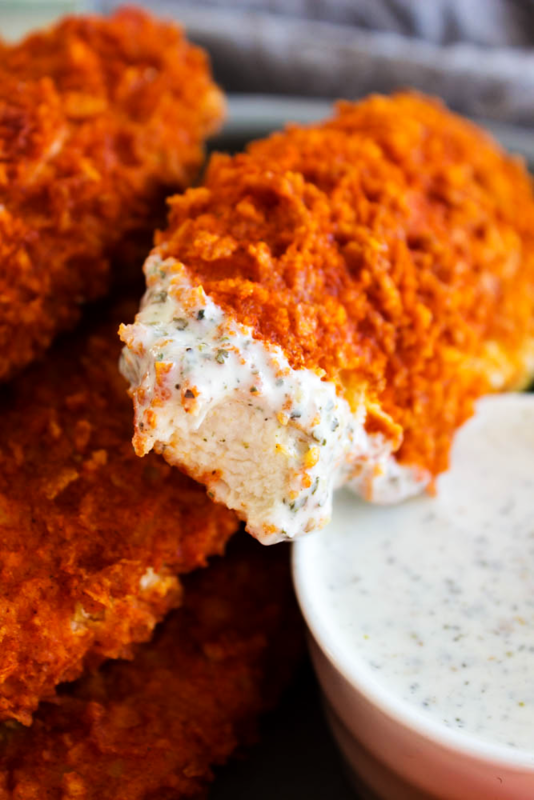 My favorite kitchen items to make this recipe for Baked Buffalo Chicken Tenders are below. 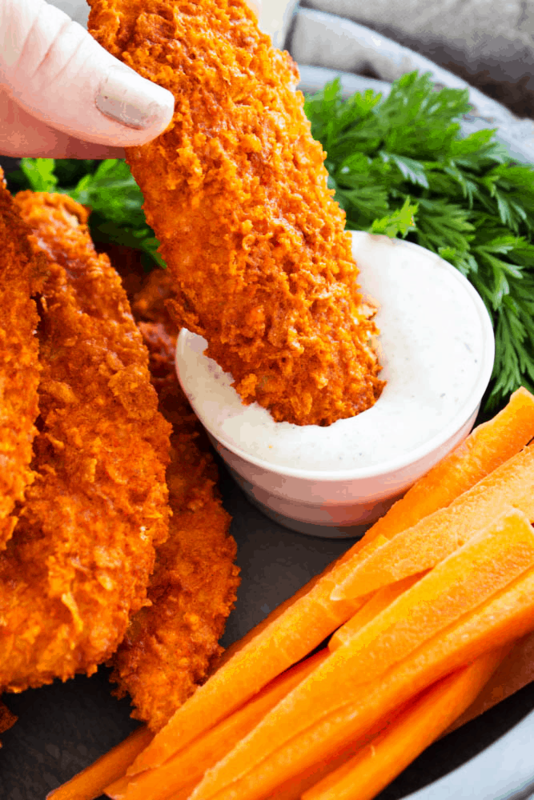 Don’t forget to pin this recipe for Baked Buffalo Chicken Tenders to your favorite Pinterest board for later. On a large baking sheet, place a wire rack. Spray the rack with cooking oil and set aside. In a large mixing bowl combine panko bread crumbs and Corn Flakes. In a medium mixing bowl combine the eggs and milk and whisk together until well combined, set aside. In another medium mixing bowl combine flour, salt, garlic powder, pepper, ginger, paprika and the Frank's Red Hot Original Seasoning. Add chicken tenders, one at a time, to flour mixture and toss until evenly coated. Remove from flour, gently shaking to remove excess flour, then dip into egg/milk mixture, let the excess mixture drip off. Place chicken tender on prepared baking rack and sheet. Repeat until all chicken tenders are breaded. Remove from oven. Using tongs dip each tender into the Buffalo Sauce, coating evenly. Gently shake off the extra sauce and return to baking rack. Continue for remaining tenders. Serve immediately with a side of ranch or blue cheese and some veggies. Yum! 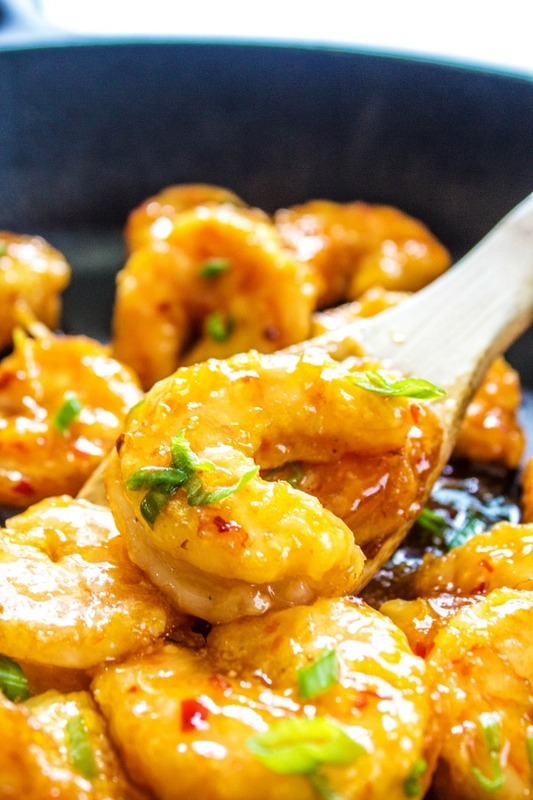 Recipe adapted from Baked Honey Garlic Chicken Tenders. These Baked Buffalo Chicken Tenders were everything and more than you said. They were very crunchy and really delicious! I will make these again and again. I did use an egg substitute and 1% milk to cut down on the fat, since my hubby is a heart patient. But these tasted just as good as any of the fried chicken tenders I’ve had anywhere. Thanks. I am so glad you loved them Sheila!